Any idea what kind/brand your plants are? I keep seeing pics of those in tanks and wishing I could find one! I like that set up, it looks like they seem to be enjoying it. From the pics the turtles look small, how big are they? I am interested in adding a Tube like that to my tank, what size is it? My tiny turtle doesn't seem like he is a good swimmer so right now I don't have much water in the tank. Grey goose, thanks for the plant pic!! I went to petsmart today and found the same one, but they only had the medium and I wasn't really impressed with how it looked. Then later in the day I stopped in to a local farm/pet store on a whim because they have two new painted turtles in a stock tank and I like to visit them and they had a slightly different version of the plant, in the large size, for 4 dollars! I had to buy it, I'm going to cut it up and split it between my two tanks! Thanks for pointing me in the right direction! alexis_906 wrote: I like that set up, it looks like they seem to be enjoying it. From the pics the turtles look small, how big are they? I am interested in adding a Tube like that to my tank, what size is it? My tiny turtle doesn't seem like he is a good swimmer so right now I don't have much water in the tank. Thanks! Well, I believe I finished that tank last November, so they were about 8 months old then. They now have passed the 1 year mark. Beaker (see above pic, she's trying to put the bite on me) is over 4" and growing fast, she's now the largest by far. I think Big Daddy (male) is right at 4", and Gomez (sourpuss) is about 3.75". The tube is a 4" PVC fitting, you can get it at Home Depot or Lowes for about 10 bucks. Somewhere in this thread is a description on how I decorated it with genuine imitation plants....in fact I cut up one of those plants pictured above. Last edited by grey goose on Fri Mar 30, 2007 10:29 pm, edited 1 time in total. Starchick wrote: Grey goose, thanks for the plant pic!! I went to petsmart today and found the same one, but they only had the medium and I wasn't really impressed with how it looked. Then later in the day I stopped in to a local farm/pet store on a whim because they have two new painted turtles in a stock tank and I like to visit them and they had a slightly different version of the plant, in the large size, for 4 dollars! I had to buy it, I'm going to cut it up and split it between my two tanks! Thanks for pointing me in the right direction! My pleasure, I like going into the little mom and pop pet stores around here. You can often find things that the big stores don't bother to carry, and at a good price too! After seeing your set up and loving all of the extras, I went out to a couple stores. I have a small tank so I can't do too much but I did make some things work for my tank. Here is a pic, he seems to really enjoy it so far. I put some live plants in one corner by the rocks and that he loved and helped him feel more comfy. I used a 3" elboy-black in the left corner and there is a little shelf in the right corner with the rocks for him to hide under. Very nice and natural looking. Everything in my design is made for easy cleaning. With the exception of the hoses and filters, I can strip down my 90 gal tank in five minutes flat. Everything, including the ramps, gets put in a large Tupperware container and taken downstairs to be rinsed off. Then I do the water change, and put everything back. The whole thing takes about 1/2 hour (using a Python, of course). Nice looking tanks. 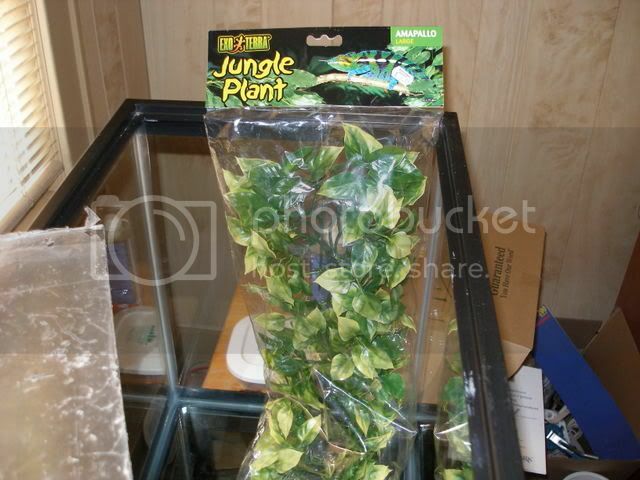 I've got a few of those jungle plants in two tanks and they do look nice. With time and after repeated cleanings, however, I've found they do tend to get brittle and the leaves will start falling off (I usually lose one a cleaning now). If you're going to let the plant float, I'd cut off the stem that has the suction cup (there's metal in it and it will rust). If you're going to suction it to the side of the tank, I'd have the stem with the suction cup above the water line. If anyone is concerned about the metal (I'm not, mine is completely covered) just slide the suction cup off, cut the wire with a wire cutter at the base where it meets the plant, then thread a small nylon tie thru the hole in the suction cup, tie it to the plant where the wire was and it's fixed! Hi, WOW thanks a lot for lots of great ideas! I just have a question about the basking ramp. How does the ramp bent in looks to be at a ~25 degrees angle? At any rate it's really a guess (can't find my protractor). I just "eyeballed" it as I formed it, placing it in the tank as I went until it was where I thought it would be a comfortable climb for the turts. Ohhh...does the acrylic board just simply allows you to bend it to a certain angle? does it eventually level up?